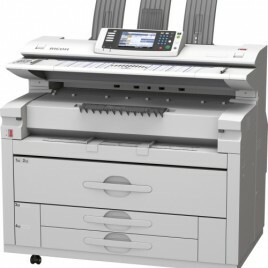 High productivity – High-speed monochrome printing at 3.2 pages/minute. Reusable Ink Cartridge – The ink cartridges can be used repeatedly by changing the ink packs. This eco-cartridge methodology helps to reduce waste costs. 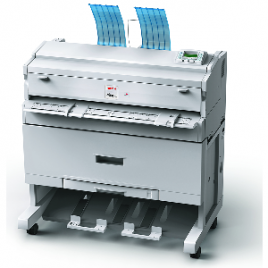 Media Output – The printed media slides on to the platen where three heaters are installed. These fix and dry the printed image as it slides through. There is an electrostatic sheet to prevent sticking. This enables secondary processing, such as lamination, to take place immediately. 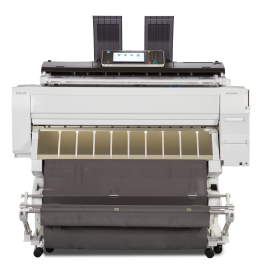 Very compact, affordable wide format printing solution. 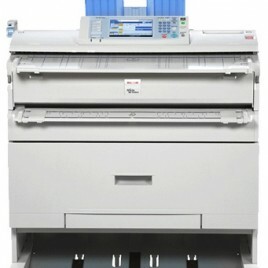 Superb print speed: 2 A0 or 4 A1 per minute. Flexible and large paper capacity with 2 Roll Feeders, Bypass and optional A3 paper cassette. Waterproof prints: toner will not smear. No need for special paper. 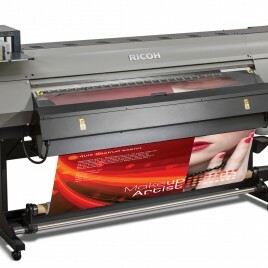 Printing all your documents from A4 up to 15 meter long drawings.